Plants are usually grown in a garden for their ornamental value or for the edible fruits, vegetables, and herbs they produce. As such, some plants tend to be grown in flower gardens or water gardens while others are more often grown in vegetable gardens or herb gardens. A garden journal can help gardeners plan their gardens and track their plants' growth during the growing season. CBS News. Thursday, 18 Apr 2019 09:00:05 +0000. The primary types of garden plants include annuals, perennials, bulbs, ground covers, vines, shrubs and trees. Annuals last one season or year, and generally die when a hard frost occurs. Perennials last for several years, dying back to a dormant condition with the advent of a hard frost and developing new growth when temperatures increase after a season of cold weather. Bulbs are a type of perennial which, in their dormant stage, consist of a short stem base with one or more buds enclosed in layers of fleshy leaves. Ground covers are plants that can spread to blanket an area of ground. Vines are climbing plants that require some type of support. Shrubs are plants with permanent woody stems from which new growth arises. Trees are large woody plants that generally have a single trunk. A woody stemmed plant that grows less than 12 feet high is usually classified as a shrub, whereas a single trunked plant that grows more than 10 feet high is usually considered a tree. Click on the thumbnails to view enlarged sample images of the garden plant categories described below. Annuals, biennials and perennials are some of the most popular and well-loved garden plants, offering diverse flowers and forms as well as nuanced textures and colors. Experienced home gardeners can use the life cycle differences between these plant types to create gardens that offer satisfying textures and colors year after year. Pictured here are blue pansies. Bulbs, tubers and corms produce some of the most interesting and fastest growing plants in the garden. Their colorful blossoms range from the curiously curving cyclamen to the large alliums and calla lilies, and their crocus species flowers bloom at the first hint of spring. Pictured here is a bed of red tulips. Climber and creeper plants offer real versatility, whether used to festoon an arbor with bright flowers and foliage or modestly covering a bare patch of ground. These useful plants offer upward or spreading growth habits that can lend a sense of height or dimension to a garden. Pictured here is a climbing purple clematis. 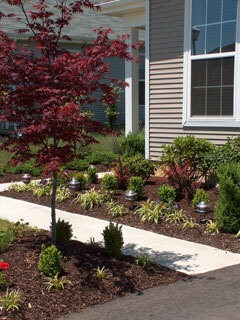 Shrubs have a reputation as reliable, dense green plants that grow in planting beds near houses, but they are actually a rather diverse group of plants and have a wide range of forms, uses, and attributes. Many flowering shrubs add fragrance to the air; others feature striking growth habits and beautiful forms. Pictured here is a lovely pink azalea. Trees are the aesthetic structure of a landscape, lending dignity to the places where they grow, providing shelter for people and wildlife, and producing the oxygen needed to sustain life on our planet. Trees are typically selected for their ornamental characteristics or their fruit. Pictured here is a pink dogwood, often used as an understory tree. 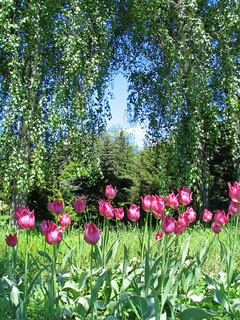 Many garden plants can be viewed in attractive settings at various botanical gardens around the country. These gardens can provide inspiration and ideas for home gardeners and commercial landscapers. For instance, the United States Botanic Garden, considered the Nation's Garden, is located in Washington, DC. It features a wide array of plant exhibits and lectures for visitors. Longwood Gardens, located in Kennett Square, Pennsylvania, is one of the premier botanical gardens in the United States. Longwood's beautiful gardens feature carefully labeled plants; they also offer horticultural internship programs for students. GardenPlants.us features a convenient directory of online plant nurseries and gardening resources. The garden plant vendors listed herein offer a broad selection of garden plants and gardening accessories as well as plant information. Offers innovative gardening supplies, composters, greenhouses and garden carts. Shop for organic gardening supplies, fertilizers, and pest control products. This retail mail order nursery specializes in old, new and unusual roses and features a wide selection of roses from various rose hybridizers. Founded in 1897, this rose nursery website features rose care information plus a searchable catalog of hybrid roses. 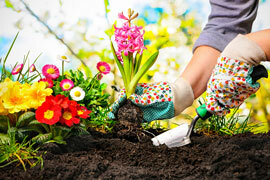 This gardening website features comprehensive guides to flowers, herbs, and vegetables. This map shows, in detail, the lowest temperatures that can be expected each year in the various climate zones of the United States, Canada, and Mexico. Plant hardiness is generally specified by zone, as shown on this official map from the U.S. Department of Agriculture. Searchable plant forums feature information, images, and citations concerning garden and plant topics. This organization works to renew and sustain the connection between people, plants, and the environment. Their website caters to plant enthusiasts and professionals, as well as plant breeders and gardeners. Features an introduction to organic gardening, plus garden products, recipes, and useful articles about all aspects of gardening. Browse this site for a wealth of information on gardens and horticulture as well as floral and nursery plants research. Pond Supplies - garden pond equipment and accessories. Seed Catalogs - flower, vegetable, and herb seeds.